What happens when Google offers your product for free? You know how every VC asks “what happens when Google gets into your business?” Well, that just happened to us. Again. If you’re in a business remotely related to something Google does (or could do), you’ve had the same concerns. Google has had a long history of getting into new markets, offering services for free, and hoping to monetize them via its cash cow – paid search. Here are the reasons we’re not worried, and you shouldn’t be either. Three months after we launched our beta in 2010, Gmail announced Priority Inbox, which does exactly what we do – prioritizes emails. That was a scary day for us: half of our beta users left. Since then, most of them came back, and today 60% of our customers are on Gmail, and prefer to pay us money for something Gmail offers for free. So we have been keeping a close watch on Gmail Tabs. Thankfully this elicited even less reaction from our user base than Priority Inbox. Why you ask? We’re told it’s because our algorithms are more personalized to each person’s behavior, which requires processing a lot of data in real time (not something you can do on the cheap). One of the reasons to charge for your products is it allows you to build better products (Death to Freemium!). Google doesn’t have that luxury. Use it to your advantage and compete with Google on value, not price. Can Google offer a better email filtering product for free? Maybe. However, our business is evidence that it is possible for David to build a better product than Goliath – at least for a particular segment. In every large market there are lots of segments. Ours is professionals who value their time and are happy to pay for better products. If someone is happy with a free version (or can only afford the free version), they are not our target customer. If they’re unhappy with the free version – they will look for us. If they are ok with the free version, but want something better – it’s our job to get in front of them. This brings me to the last point. For many startups the greatest challenge is not competition – it’s lack of awareness. People simply don’t know there’s a solution to their problem, as is the case with email overload. Everyone suffers from it, but nobody searches for the solution (the search volume for related keywords is ~0). So when Google educates the market on the value of email filtering, it’s a good thing. Gmail’s Priority Inbox made our positioning easy: “We are Priority Inbox that actually works.” Not a bad pitch to have. If Gmail was the only email provider out there, we would be more worried. Luckily there’s Yahoo Mail, Exchange, Office 365, Lotus Notes (yes, there are 100 million people using Notes), etc. These folks aren’t as spoiled with helpful add-ons in their Inboxes as Gmail users are. When they hear about cool stuff Gmail is doing, they want it too. We’ve capitalized on that by making our service provider-agnostic. It’s exceptionally difficult technically, but very powerful: “We are Priority Inbox that not only actually works, but works on any email provider, client and device.” Should we ever lose the Gmail market we still have the other 80% of the email market to capture. There are lots of things that can kill a startup. Google entering your space shouldn’t be one of them—it can actually help. We’re living proof that it’s possible for a small startup to compete with a giant, in the giant’s backyard. 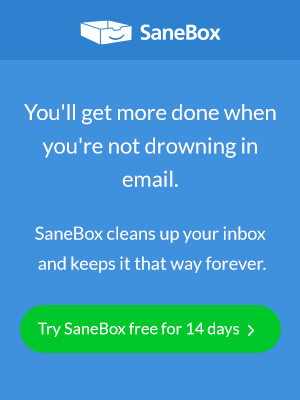 Next Entry People LOVE SaneBox for Email Management!